There are three types of standard DC motors: series, shunt, and compound (cumulative). The selection of the proper type of motor is based on the type of load that the motor is intended to operate. 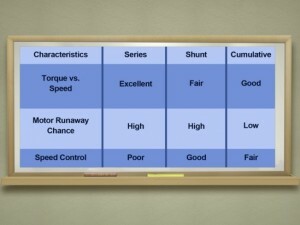 The following chart provides a comparison of the main operating characteristics of the series, shunt, and cumulative DC motors. The series DC motor connects the armature and field in series where the armature and field currents become identical. This design allows series DC motors to develop a large torque and the ability to be operated at low speeds. This type of motor is well-suited for starting heavy loads, often used in industrial cranes and winches. A shunt motor has the field winding in parallel with the armature. The characteristics of a shunt-wound motor give it very good speed regulation, and it is classified as a constant speed motor, even though the speed does slightly decrease as load is increased. Shunt-wound motors are used in industrial and automotive applications where precise control of speed and torque are required. A compound motor has both a series and a shunt connected field winding. This gives it a greater torque than a comparable shunt motor and is fairly constant speed. Loads such as presses, shears, and reciprocating machinery are often driven by these types of motors.